If you’re still on-board the Hitman train after the announcement of it going episodic, then you should be quite excited for the launch of the upcoming Hitman Beta for the PS4 and PC. Square Enix dropped off the official Hitman – Beta Launch Trailer this morning, so make sure to see what you’re getting yourself into below. Episode 1 of Hitman is set to hit the PS4, Xbox One and PC on March 11th, 2016. HITMAN will launch on March 11th for the PlayStation 4 computer entertainment system, Xbox One, the all-in-one games and entertainment system from Microsoft, and Windows PC. 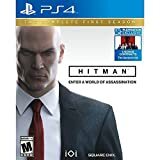 The HITMAN beta starts on February 12th through February 14th on PlayStation 4 and February 19th through February 21st on PC. Players can guarantee access to the beta by pre-ordering the Full Experience or the new Intro Pack.